Electair Exports Ltd started as an export name of Bubbling Spas Ltd in 1979 to sell air switch systems and spa controls to USA customers. The Bubbling Spas name was sold and Electair Exports Ltd then became the main company. Later, the UK control business that was in Bubbling Spa was bought back and absorbed into Electair Exports Ltd.. In the unlikely event of a complaint we will do everything we can to satisfactorily resolve it if we are at fault or not, providing the control was installed to the manufactures instructions by an approved engineer. (Approved engineer is SPATA approved ISPE registered installer or Part P registered electrician in asocation with a qualified swimming pool engineer or registered Electair approved installer.) A copy of the electrical test certificate should be sent to Electair with the site address. Minor faults are the responsibility of the installer to fix. We will provide all spare parts. 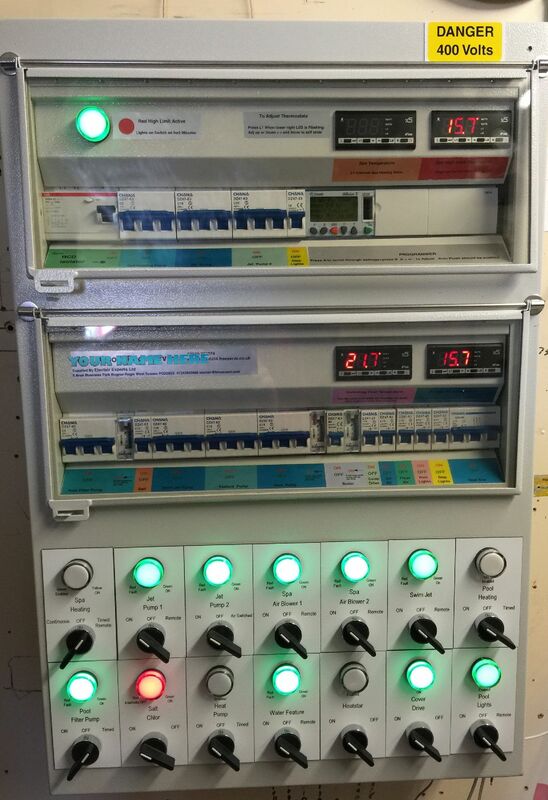 It is very rare for a system be faulty but occasionally indicator lamps can fail and time switches not work. Incorrect temperature reading are usually the sensor not being pushed to the bottom of the pocket. Repair Procedure: First telephone Electair on 01243 842888 and confirm by email to roger@electair.co.uk. Please include an image if it is 'in transit' damage or something scratched. For technical faults, we will make an appointment for an electronic meeting with your installer using Facetime or the like if connection is available, as this is the quickest way to resolve problems. If we are found to be at fault we will pay your engineer's time providing he has an agreement on his charges before he visits site. If the unit under complaint has not been installed correctly or undersized cables used for the supply or incorrectly specified for the job and we visit site, this will be chargeable. We have been in business over 30 years and have never had outstanding issues . Please note it is easiest to use our order form so that you get the correct control system with any extras. How can I contact Electair Exports Ltd? Your order is an offer to Electair Exports to buy the product(s) in your order. When you place an order to purchase a product from Electair Exports, we will send you a message confirming receipt of your order and containing the details of your order (the "Order Confirmation"). The Order Confirmation is acknowledgement that we have received your order, and does not confirm acceptance of your offer to buy the product(s) or the services ordered. We only accept your offer, and conclude the contract of sale for a product ordered by you, when we dispatch the product to you and send an email confirming to you that we've dispatched the product to you (the "Dispatch Confirmation"). If your order is dispatched in more than one package, you may receive a separate Dispatch Confirmation for each package, and each Dispatch Confirmation and corresponding dispatch will conclude a separate contract of sale between us for the product(s) specified in that Dispatch Confirmation. Your contract is with Electair Exports Ltd. Without affecting your right of cancellation, you can cancel your order for a product at no cost any time before we send the Dispatch Confirmation relating to that product. What are my rights of cancellation? Unless one of the exceptions listed below applies, you can cancel your order without giving any reason within 14 days from the day on which you or a third party indicated by you (other than the carrier) receives the goods purchased (or last good, lot or piece if it relates to goods or multiple lots or pieces delivered separately) or from the day of the conclusion of the contract. You must inform us (Electair Exports) of your decision to cancel your order. You may submit your request by contacting us. To meet the cancellation deadline, it is sufficient for you to send your communication before the 14 days’ cancellation period has expired and return the item direct to us. Note that you must send back the goods no later than 14 days from the day on which us you communicate your cancellation. You will have to bear the direct cost of returning these goods. You may be liable if the value of the goods returned diminishes due to the handling of the goods (except when it was necessary to establish the nature, characteristics and functioning of the goods). a service if Electair Exports has fully performed it and you accepted when you placed your order that we could start to deliver it. How will I know about pricing and availability? All prices are liable to legally applicable VAT at the prevailing rate. We list availability information for products sold by us on the website including on each product information page. Beyond As we process your order, we will inform you by email or by phone as to estimated delivery times. Delivery estimates are just that. They are not guaranteed delivery times and should not be relied upon as such. We will verify pricing when processing your order and before we take payment. If we have made a mistake and a product's correct price is higher than previously quoted, we may either contact you before dispatch to request whether you want to buy the product at the correct price or cancel your order.